I received a copy of this book from Netgalley and Pan Macmillan Australia in exchange for an honest review. Contains minor spoilers for Dreamer’s Pool. 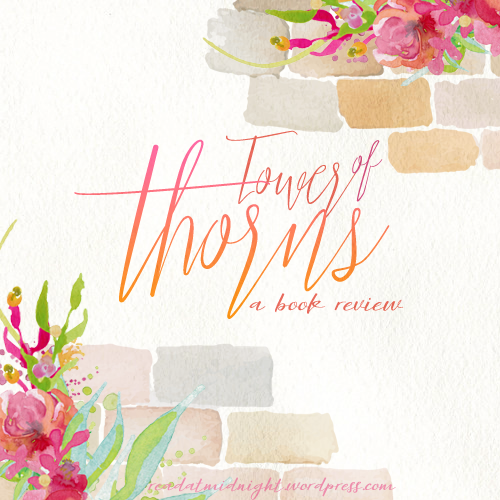 I am happy to announce that Tower of Thorns is a superior sequel in every way. While I enjoyed Dreamer’s Pool, I felt it was slightly different from the usual Juliet Marillier books that I’ve grown up loving. 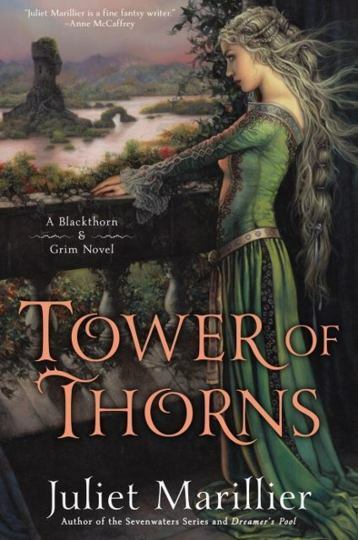 With Tower of Thorns, we go back to her roots with magic, fairy tale and true love. The Blackthorn and Grim novels operate on two levels. First, it focuses on the personal growth of Blackthorn, as well as her developing partnership with Grim. Secondly, there’s a monster-of-the-week type side story that head spear each book, narrated by a lord or lady that Blackthorn is assisting. Monster in ancient tales were often a disconcerting mixture of man and creature… But in my book, the vilest and worst was the human monster. Thematically, the book continues the fairy tale retelling tradition of its predecessor. While Dreamer’s Pool took its inspiration from The Goose Girl; the story in Tower of Thorns has elements of Briar Rose. In both cases, Juliet Marillier skilfully twisted familiar storylines and delivered them to us in refreshing ways. Older fairy tales weren’t all sunshine and rainbow, in Tower of Thorns, we are presented with the darkest aspect of storybook fancies. There’s a desolate, abandoned towers. There’s thorns. There’s a curse, brought about by love gone wrong. As I am a huge fan of darker fairy tale retellings, the route this book took managed to keep the side plot fresh and exciting. Every ancient tale has truth at its heart,” I said. “That’s what I’ve always believed, anyway. But after years and years of retelling, the shape of those old stories changes. What may once have been simple and easily recognized becomes strange, wondrous and magical. Those are only the trappings of the story. The truth lies beneath those fantastic garments. Another thing I found enjoyable about the book is how it subverts the happy ever after trope. While the story remains deeply rooted in fantasy, it also has a touch of realism in the way it challenges the expectations of folk tales. Both the villain and the protagonists of this piece questions the presence of true love and the presence of fortunes which favour the young and the brave. I love that the book does not offer easy answers, there’s no true love’s kiss or fairy godmothers to magic away all the problems. The darker twist grounded in reality set the tale apart. There is no such thing as love. Passion, yes. Possession, most certainly. But love? It exists only in the soft minds of human men and women. Love will not save your young man. Grim who had stood by me when I was at my worst. Who, in the foul days and nights, had always called me Lady, as if I were above it all. Grim who had saved me from myself, over and over. Speaking of true love, I also adored the juxtaposition between the pure partnership between Blackthorn and Grim VS the more lust-filled love at first sight featured in Lady Geleis’s tale. I was a little bit disappointed by Dreamer’s Pool due to the relative lack of romance in comparison to Juliet Marillier’s previous works. However, I think even in the absence of heavy romantic undertones, the friendship and trust between Blackthorn and Grim is a beautiful thing to watch. Events in this book meant that Blackthorn decided to withhold some information from Grim, and it made for a painful yet satisfying conflict. I love that they are rediscovering themselves and their humanity through one another. The highlight of the series continues to be the main character and their relationship, though the beautiful and terrible fairy tale also added an edge that I missed in Dreamer’s Pool. This is certainly a novel that would delight all Juliet Marillier’s fans! I loved loved loved dreamers pool. I am so very excited to get to this next book. I am so happy to see it was awesome too. I love the Blackthorn and Grim. Both are just exceptional stories. I do enjoy the two part story of these books. The story in the immediate book and the on going story of blackthorn and girm. I added the first book to my wish list a while ago when you first talked about it… I really need to get onto this!!! Briar Rose/Sleeping Beauty is one of my favourites so I’m always on the look out for loose retellings! The book sounds fascinating and you’ve said so many great things about the author that I should pick up at least one book by her soon. Winter will probably push me to do that 😀 I’ll be craving retellings after I finish that book. This book sounds so immersive. The quotes you’ve put up are beautifully written. I particularly like the one about ancient stories changing over time. She definitely knows her fairy tales. I’m glad that this one was a better book for you than the first one! I hope your first Marillier experience is going well, Nick ❤ Her more recent books have been uneven for me, but I feel this one really lives up to her previous great work! HI AENTEE!!! I just read Nick’s post and since she’s one of my very favorite people I knew I had to come over here asap and wave at you like the nerd I am 🙂 *waves* So glad to have found your blog! Your graphics are absolutely amazing, and your review is equally gorgeous. Can’t wait to keep visiting! Hey Jenny! Thanks so much for stopping by my blog and for your kind words. Looking forward to getting to know you! It sounds great! Definitely on my TBR! And can you believe it, I’ve only read ONE book by Juliet Marillier and that was Wildwood Dancing. I agree, Marillier is a spectacular author. I need to read more of her books. Thank you for the great review as always! I definitely recommend Daughter of the Forest if you have enjoyed previous Marillier works. That’s her most beautiful IMO!! I am so glad that you read and reviewed this book. I have been on the fence if I should put it higher on my TBR list and now I know that I will have to for sure! Glad to hear that I could help out with your TBR. If you enjoyed Dreamer’s Pool then this book would definitely please you!! Ooo this book would be perfect on audio! Especially for Lady Geleis’s chapters. Can’t wait to see what you think of it! Yes this one was even better than the first! I can’t wait for the sequel! Blackthorn and Grim are killing me both with their beautiful relationship!! I’d re-read the scenes of Grim and Blackthorn’s friendship if I wanted to carry a grin for the rest of the day. (That scene in the tower – seriously, I love them so much). I love the quotes you’ve chosen to share too. I wish I’d made more notes about quotes but with my favourite writers, i want to quote everything, so in the end I just talked about Grim and Blackthorn a lot in my review lol. I completely agree about the subversions. I also loved how self-aware both Blackthorn and Lady Geleis were about tales being built around them too. It’s so uncommon to see such selfless friendship in fiction or real life. Their relationship is incredible. I much agree, I love the touches Marillier added about how myths and formed and retold in this book!! Wonderful review, Aentee! I love your quotes. I’ve only read Daughter of the Forest Juliet Marillier and while I loved it I haven’t picked up anything by her since. In truth I’m a little intimidated by the length of her novels. Also her books have, I don’t know, desperation in them… While I don’t want the happy ever after in all my books, more often than not I want a book to make me happy (especially when I’m tired and busy in real life, which is pretty much all the time recently). So I guess I need to be in a right frame of mind for Marillier’s books. Though I do love darker fairy tale retellings. You’re absolutely right, a lot of her books have a note of melancholy. Especially in Sevenwaters with the waning of magic in the world. It’s still worth it though as I feel her writing is ultimately quite hopeful!! Hope you get a chance to check the book out, T. K!! Yeah her books are always a bit melancholy. I can’t handle reading them all in one go either. I binge read the first three books in Sevenwaters and it made me SO SAD.